This is the second article from the series on free word processors. First one was about Roughdraft. Till recently, TextEdit was the de-facto choice for word processor for Apple. When you ned to scribe quickly a note or two, and don't want to use a full word processor, Text Edit was a great help. You can get more information about TextEdit or download it at the Apple website here and here. Peach has given a nice article here. 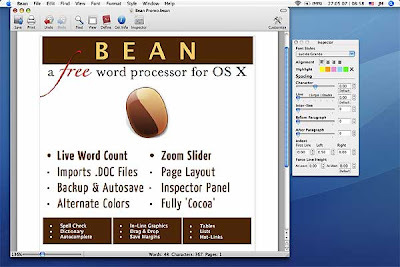 But now, they have come out with Bean, which starts from where TextEdit has left. It is a small, simple word processor (actually a rich text editor), with many niceties added to make writing convenient, efficient and comfortable. Don't compare Bean with MS Word. It will be comparing Apples with Oranges. Bean is open source and right now is in Beta. You can get more information on the OS-X website and down it here.